60 years ago, on 2 June 1957, the first Trans Europ Express ran. 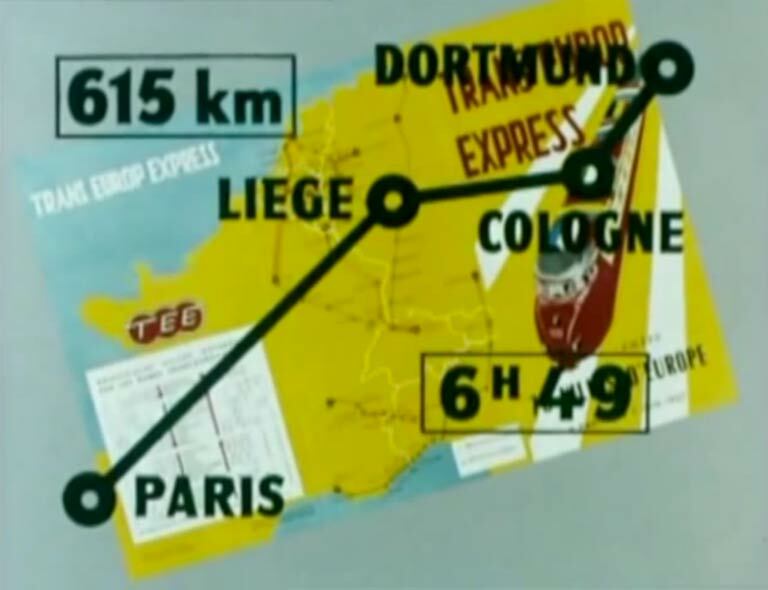 The TEE was the most legendary episode of postwar European railway history. Eight railway companies cooperated to compete against emerging air travel. 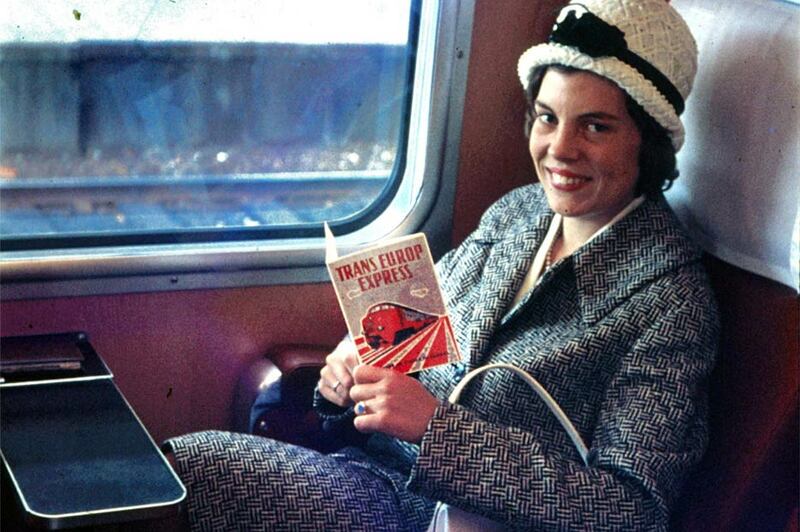 The modern and fast trains with only first-class seats — at a surcharge — were primarily aimed at business travelers. In 1957 the TEE network connected 70 cities and no less than 130 twenty years later. The TEE was innovative not only technically, but also in terms of design. 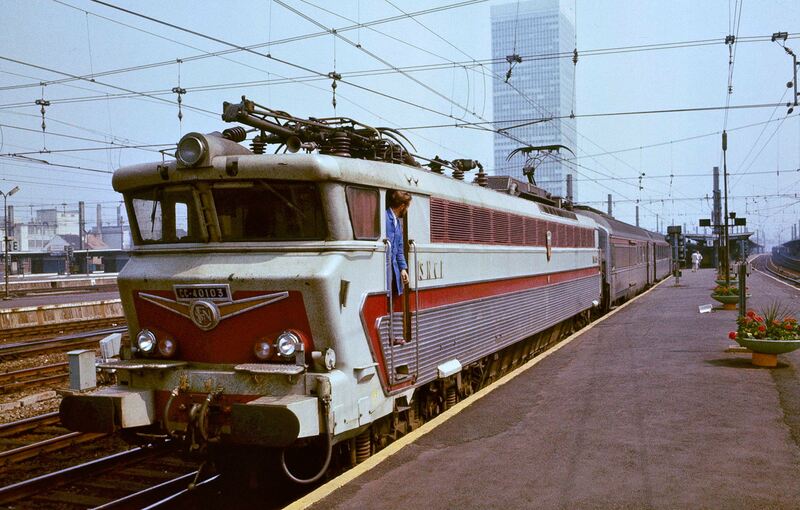 The strikingly designed trains in red and cream livery contributed to the legend. 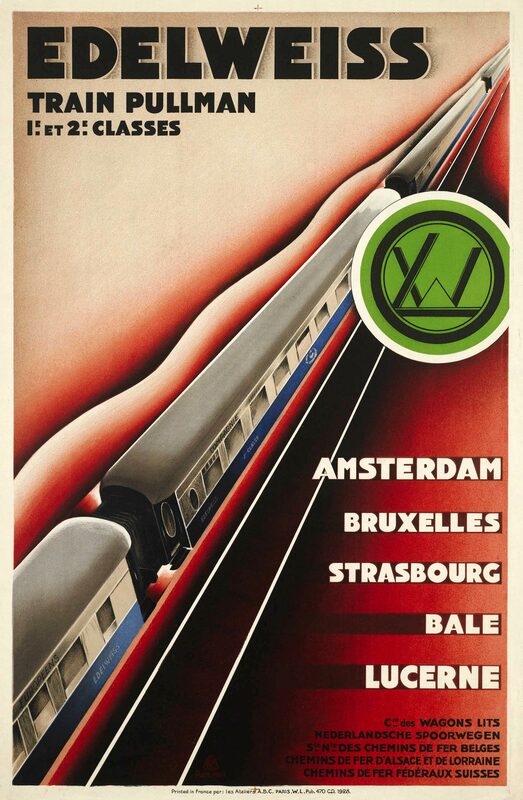 The recognizable shapes of the railcars were very suitable to depict on posters. It was not a coincidence that the TEE emerged at the same time as the EEC. The spirit of the times called for European cooperation. Originator and inventor of the TEE was F.Q. den Hollander, president of the Dutch Railways (NS). 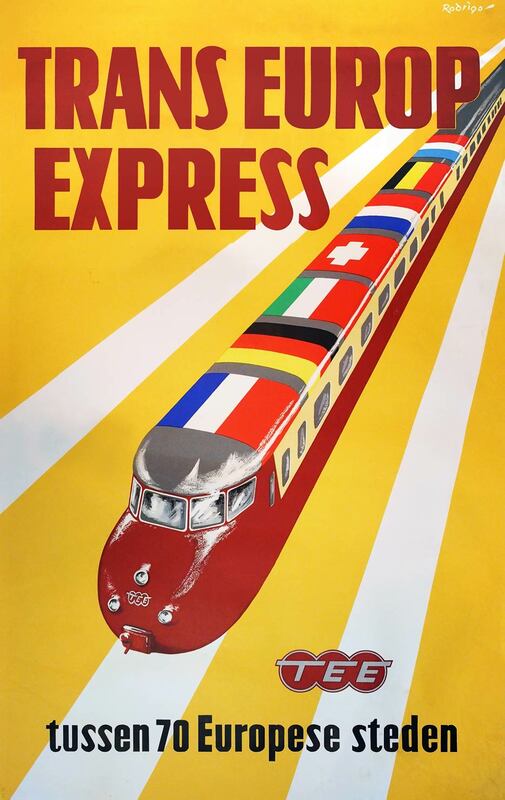 In 1953 he introduced the idea of ​​a Europe Express, which eventually became TEE after consultations within the International Railway Union UIC. 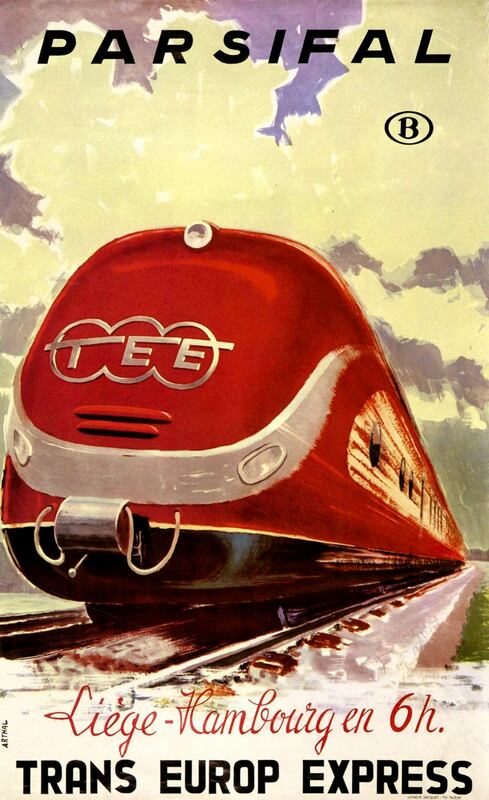 Technically, the TEE drew on the streamlined diesel railcars that were constructed since the 1930s. Electrification was still too fragmented for international traffic, so new TEE diesel units where ordered: Dutch-Swiss, French and German. All three can be seen on a 1958 poster by Jan de Haan. 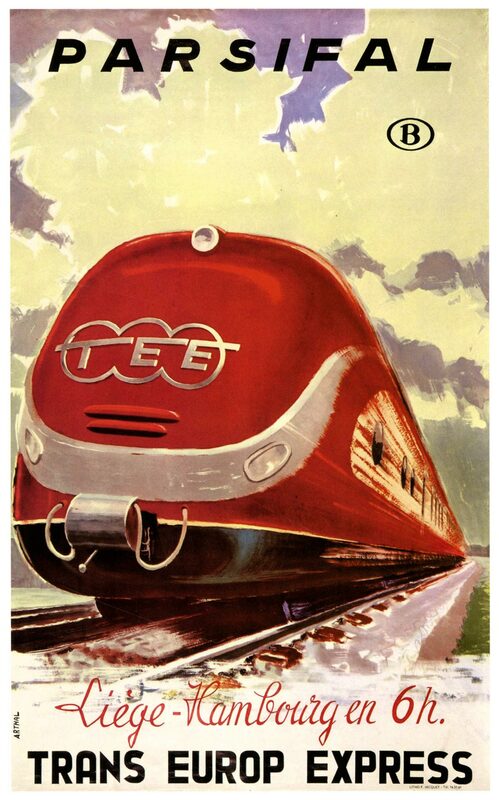 The logo, used on al TEE trains and advertising materials, was designed by the Dutch surrealist painter Joop Moesman (1909-1988). To earn his living he worked at the graphic department of the Dutch Railways (NS) for decades. The son of a local printer and photographer had attended drawing lessons and the Graphic School in Utrecht. 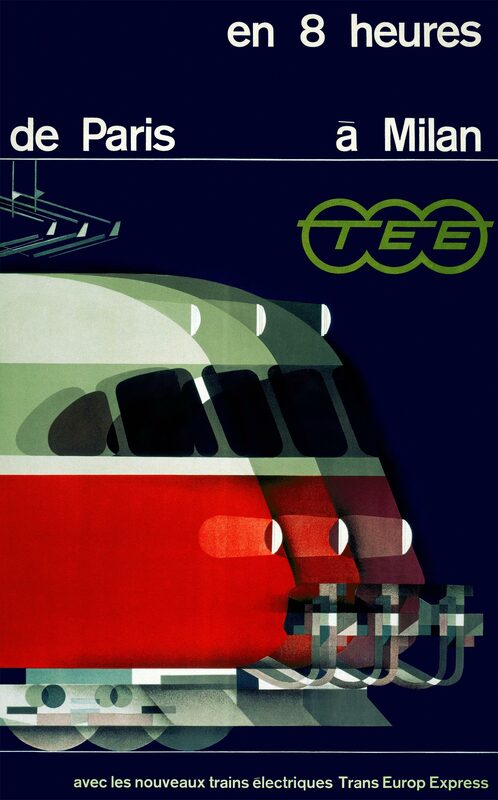 The wayward Moesman spoke scornfully of his railway job, but besides 'the fine print of timetables' he created several variants of the TEE logo in 1956-57. As in his type designs, Moesman applied curves and oblique lines, inspired by calligraphy. 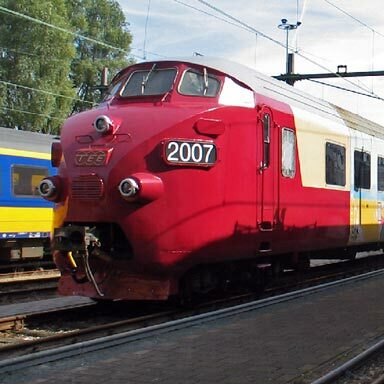 The Swiss and Dutch railways together developed a new diesel-electric trainset: RAm TEE I, called DE 4 in the Netherlands. It consisted of a motor car, two intermediate cars for 114 passengers and a control car. 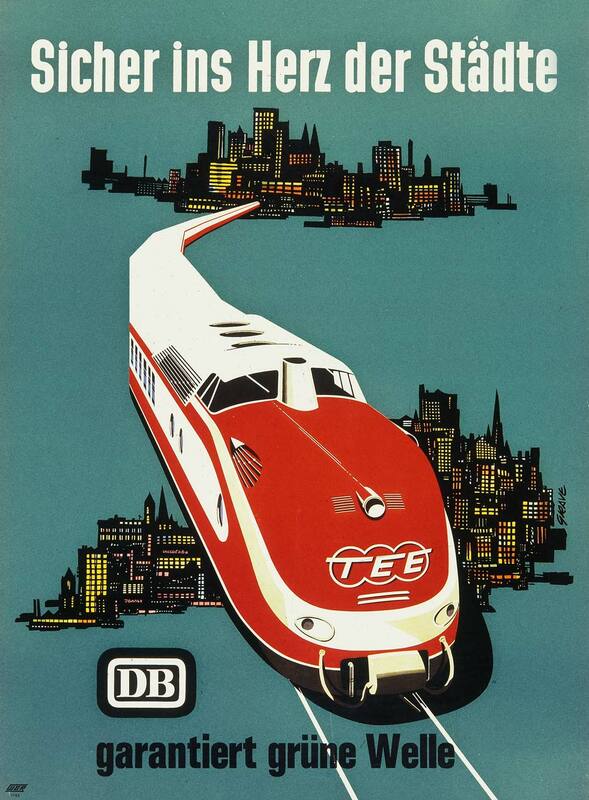 In 1957 the trains ran amongst others as TEE Edelweiss from Amsterdam to Zurich and as TEE Étoile du Nord from Amsterdam to Paris. The motor cars were built at Werkspoor in Utrecht, the coaches in Switzerland. The striking front was designed by interior designer Elsebeth van Blerkom (1919-2009). She previously designed the cafetaria and train interiors for Werkspoor. When asked to provide a proposal for the train's front, she studied aerodynamics, resulting in an egg shape made ​​up of single-curved surfaces. 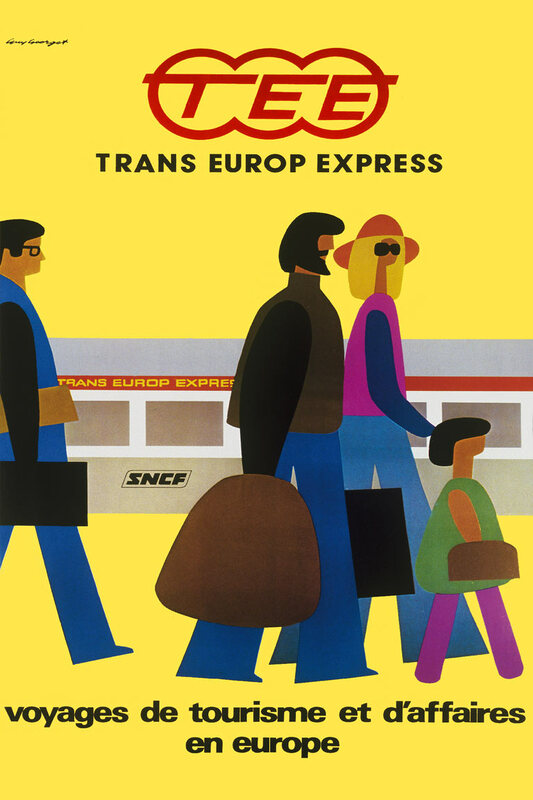 In 1957 the Utrecht painter and illustrator Jan Rodrigo (1921-2013) created the first TEE poster. He succeeded in capturing the trains's velocity and its international character. However, its sharp 'nose' is not very accurate, making it look more like a Hondekop. A brochure contains the same illustration with a better front. 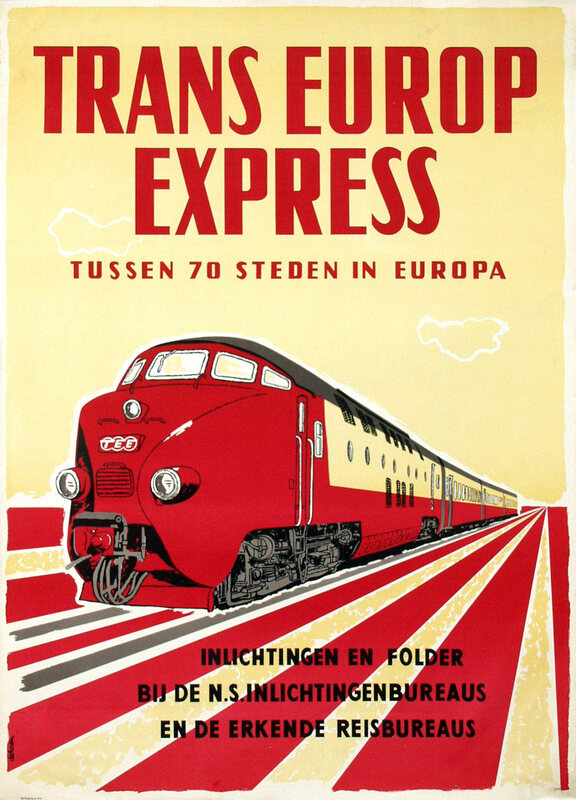 A 1960 poster draws on Rodrigo in terms of typeface, colors and lines, but the TEE trainset is much more detailed. The poster was created by Jan de Haan (1917-1975), who was employed as an advertising artist at the Dutch Railways from 1946 until the 1960s. 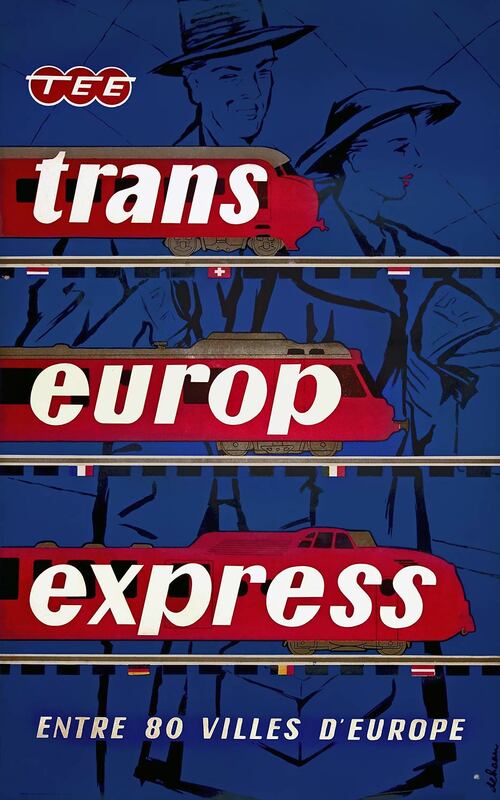 Trans Europ Express, a collective name for very fast trains connecting the heart of eighty western European cities — virtually without interruption at border stations. On June 2, 1957 the first TEE trains started to run according to their timetables. Since then they enjoy a constantly increasing interest. 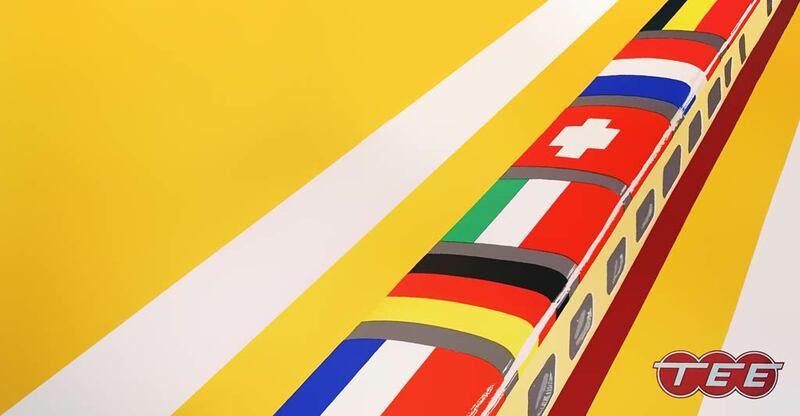 A result of good cooperation between eight European railway companies, providing the travelers with excellent service. 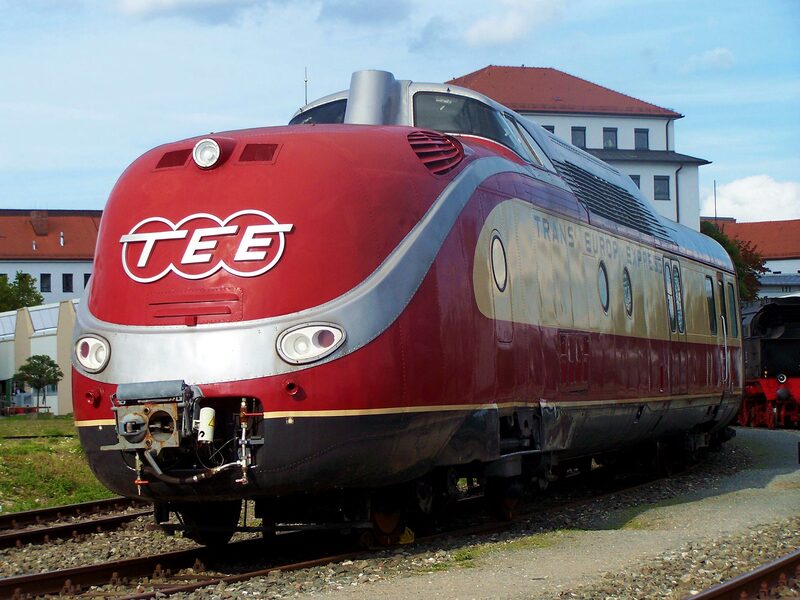 TEE trains offer you more international connections, shorter travel times and better comfort: smooth running at high speed, good temperature control, adjustable seats and excellent care of the interior. The greatest attention is paid to the meal service in the TEE trains. You will not only be a valued guest in the TEE, but you will certainly feel at home already. 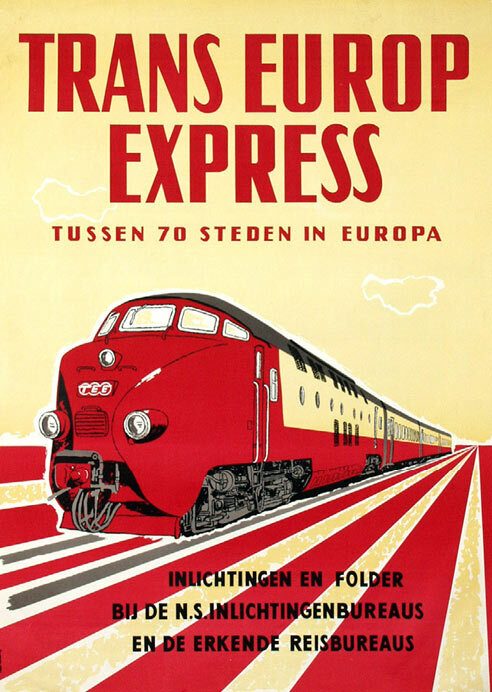 As the initiator, the Dutch railways were responsible for the kick-off of the publicity for the Trans Europ Express. 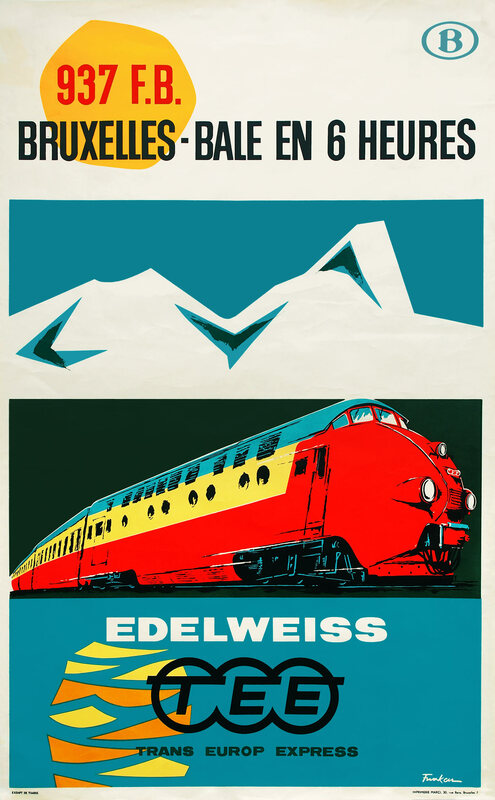 The Belgian Railways started publishing their own TEE posters in the early 1960s, as Brussels was one of the destinations of the TEE Edelweiss. 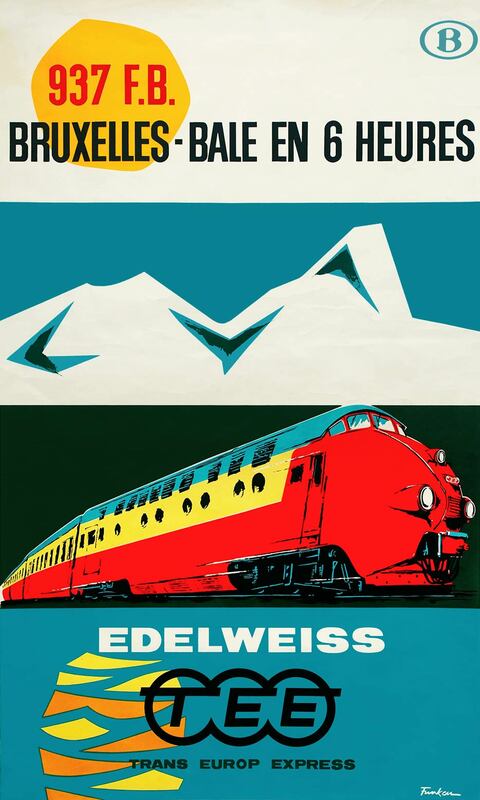 In 1962 Paul Funken (1932-) depicted the TEE Edelweiss below a Swiss mountain massif. 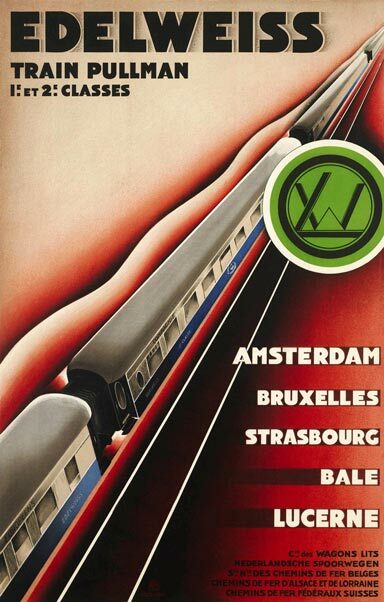 A one-way ticket from Brussels to Basel was priced 937 Belgian francs according to this poster. 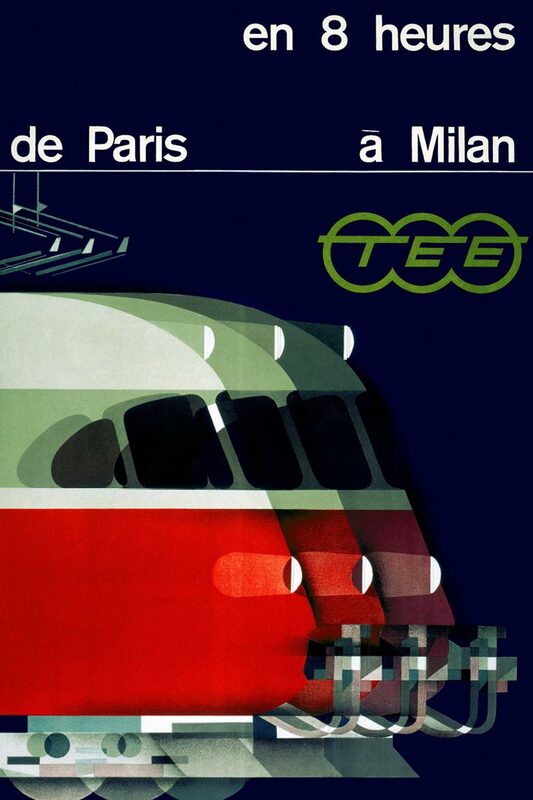 A few years later ​​the French-Belgian designer André Pasture (1928-2006) created the perhaps finest TEE poster. He captured the 'head of Elsebeth van Blerkom' in a few minimalist shapes. 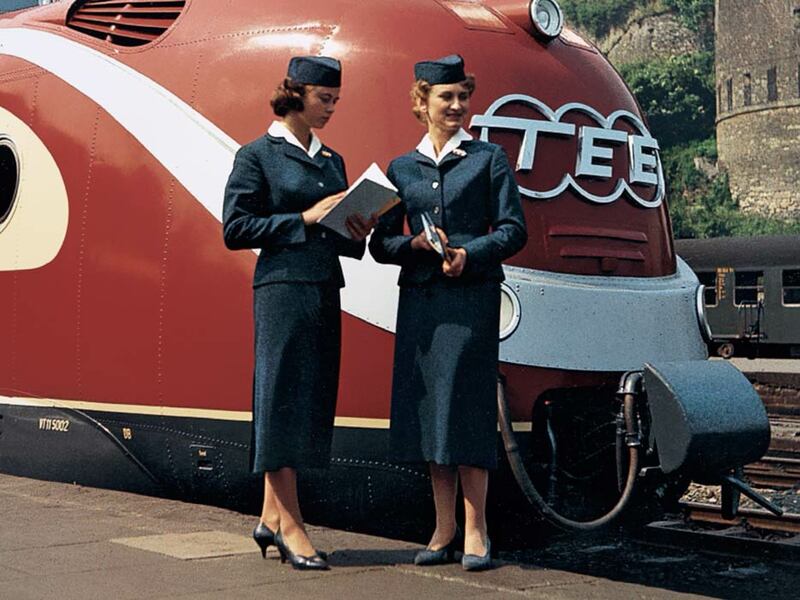 The legendary Edelweiss and Étoile du Nord trains existed long before the TEE. They had been running since the 1920s with luxury Wagons-Lits Pullman carriages. These classic cars were replaced by modern TEE luxury in the 1950s. The same happened a few years later with the Rheingold in Germany. 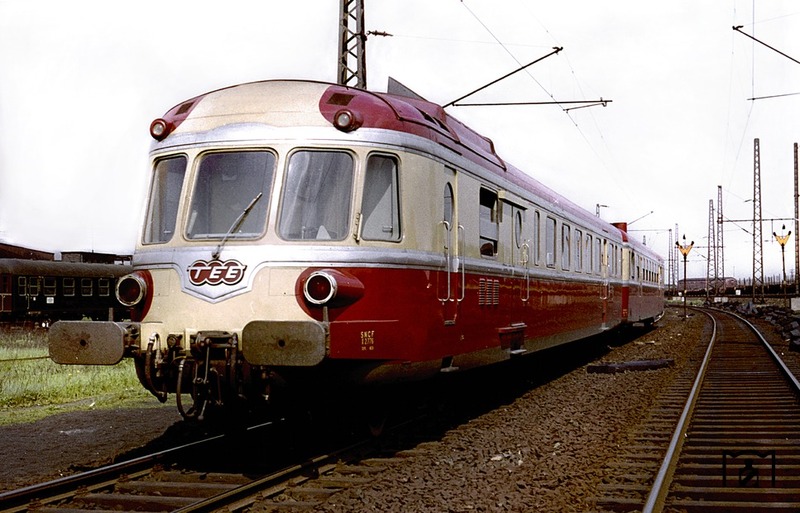 The German railways also presented a new Diesel multiple unit for TEE service in 1957, called VT 11.5. The train with its large round front and 'big smile' is sometimes called the flagship of the German economic miracle. 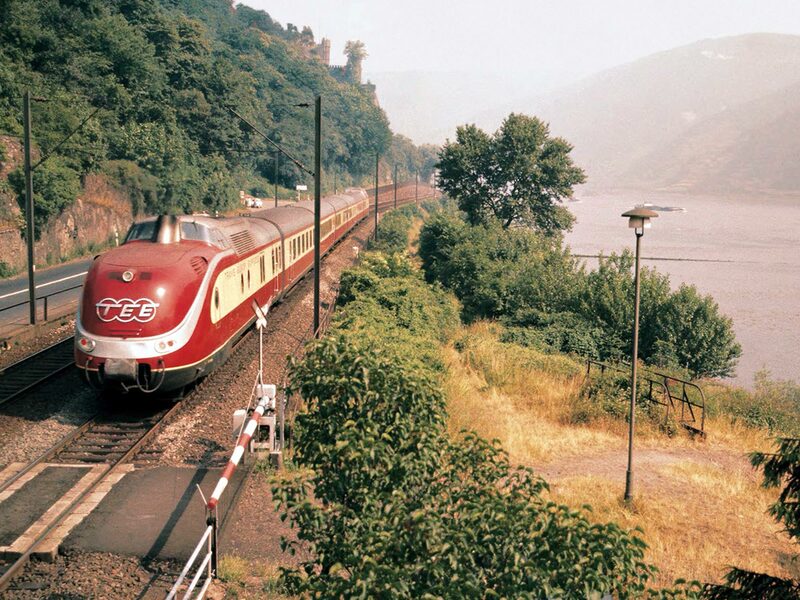 This train's services included the TEE Saphir from Frankfurt to Ostend and the TEE Helvetia from Hamburg to Zurich. 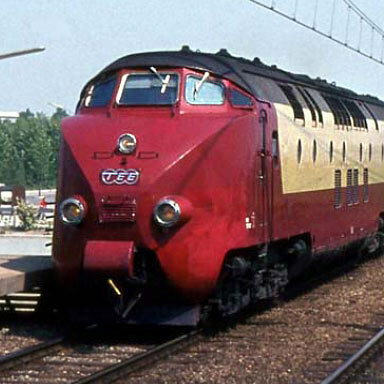 Unlike the Dutch-Swiss trainset, the VT 11.5 had two motor cars. 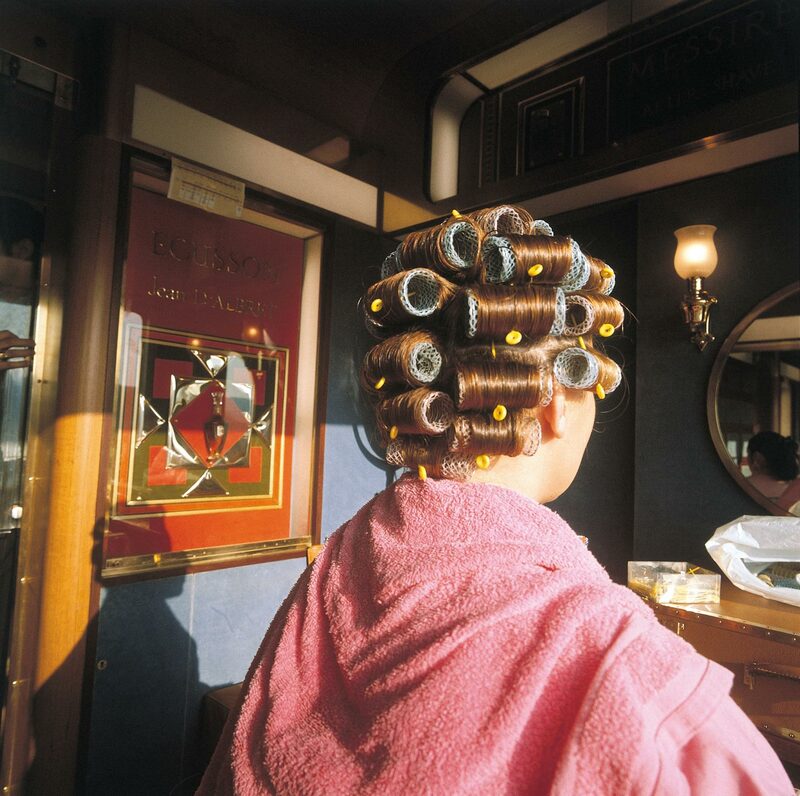 In between were a bar car, a dining car, a lounge car and two compartment cars. 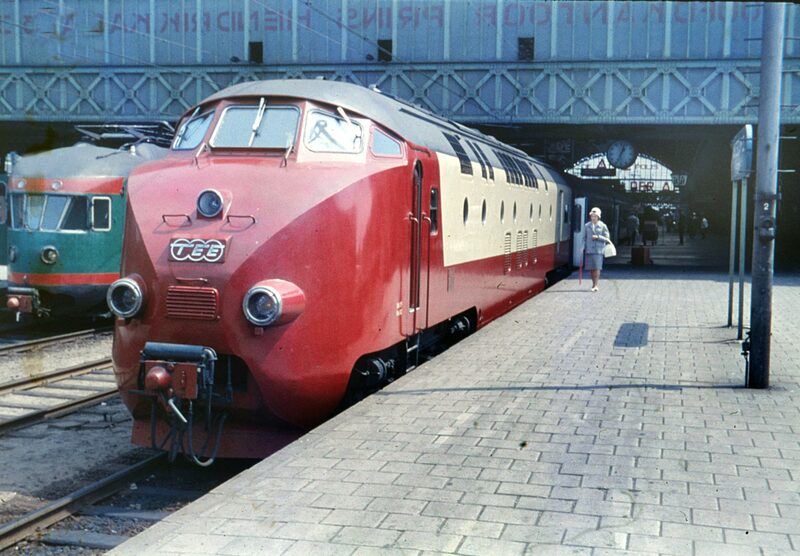 The train was designed by architect Klaus Flesche (1907-​1997), head of industrial design at MAN machine manufacturing. His work, including the TEE train, was shown at the 1964 art exhibition documenta III. 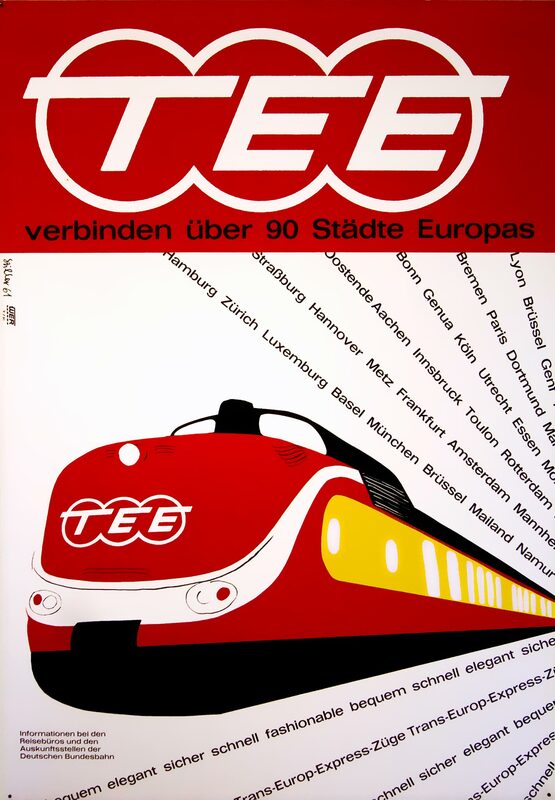 A 1961 poster for the German TEE was created by Günther Stiller (1927), an illustrator of children's books and literary works who also designed for the Deutsche Bundesbahn in the 1950s. The VT 11.5 train is instantly recognizable by its shape and color. Prominent use of the TEE emblem indicates that this logo had become familiar. Rows of words positioned above and below the train suggest speed. Above are the names of about 30 of the 90 cities connected by TEE. Below are promotional keywords like fast, secure, fashionable and elegant. A poster from 1963 shows that the TEE directly linked city centers. It was created by Grave, a designer whose details are unknown, exept for the formation of the Atelier Grave-Schmandt in Frankfurt with Hans Schmandt in the 1950s. 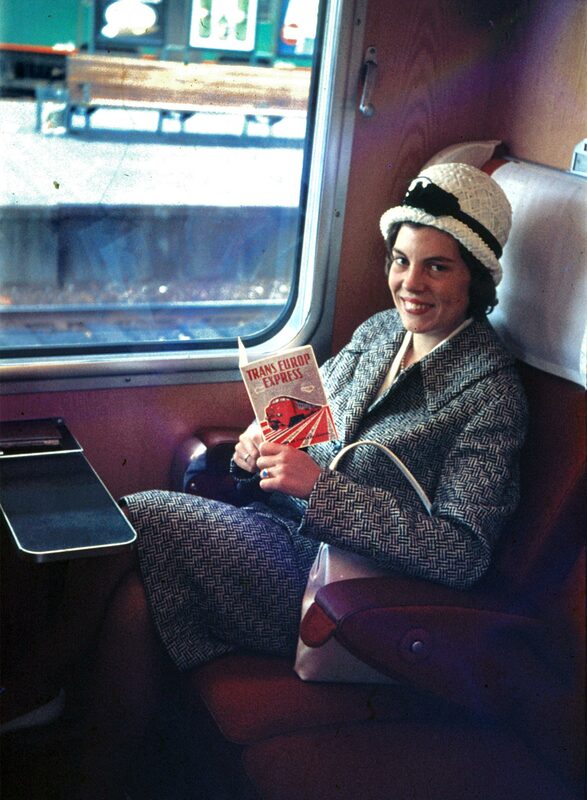 Elegance is manifest on promotional photographs, made in the 1960s by Reinhold Palm (1913-1984), the Bundesbahn press officer and company photographer. 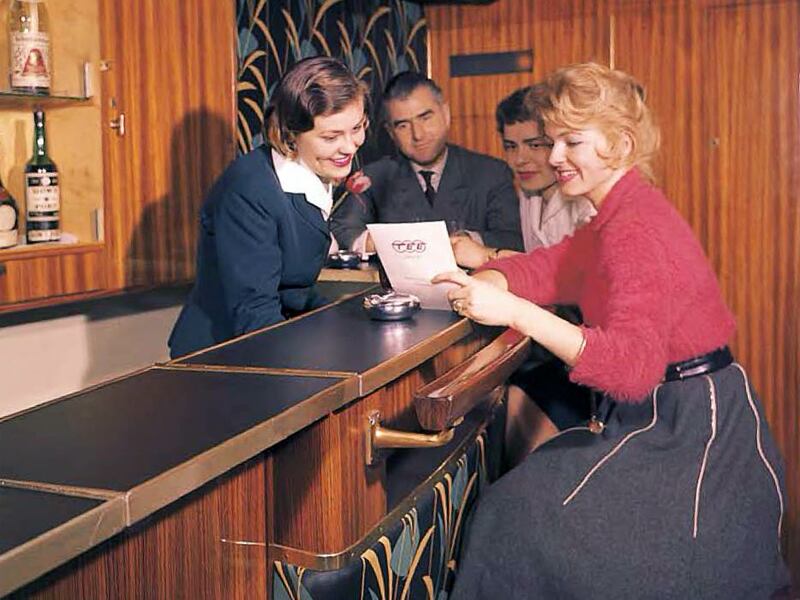 From the moment of boarding, DB hostesses stood ready to take passengers under their care. They had the red TEE emblem pinned on their lapels. 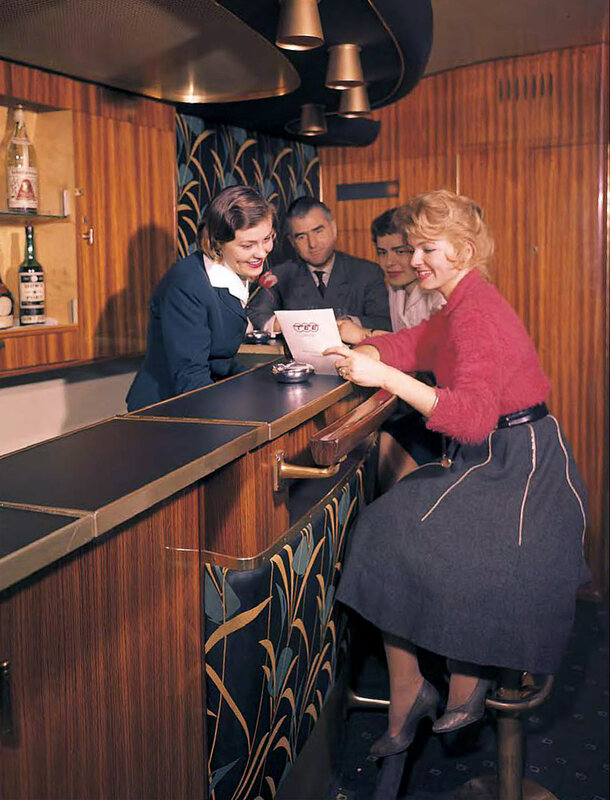 Aboard the VT 11.5 travelers could relax in the bar car, decorated with wood and floral fabric. The TEE logo was also printed on the drinks menu. TEE trains represent the utmost in luxury. 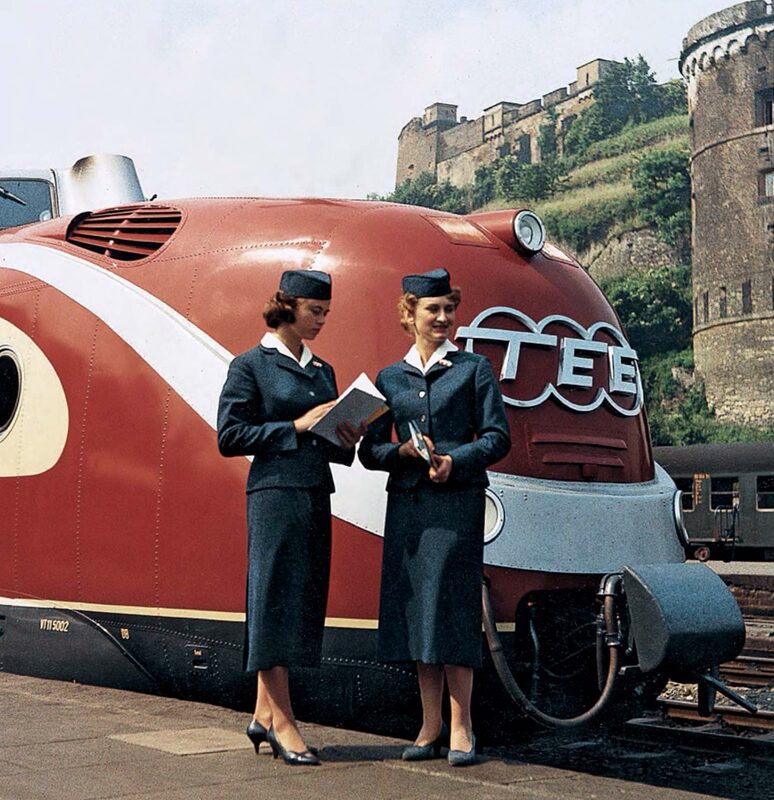 Admired for style and color, these trains have become a symbol of modern traveling. The comfort starts when you board the train. Conductor assists you with your hand luggage and escorts you to your reserved seat, a comfortable upholstered chair with movable back rest. You will have plenty of elbow room for complete relaxation. You may even enjoy a stroll down the aisles to stretch your legs. Since the capacity of the German TEE trains is limited to 120 passengers — first class only — your trip will be a smooth and pleasant one. Not a moment of valuable time is lost while you are aboard. If you would like to care of your correspondence en route, private writing compartments and tri-lingual secretaries are at your disposal. They will also dispatch telegrams, make reservations, etc. Belgium did not have its own TEE trainsets, but was connected to the network by several trains, including the German TEEs. The TEE Saphir ran to Ostend and the TEE Parsifal connected Paris to Hamburg via Liege. 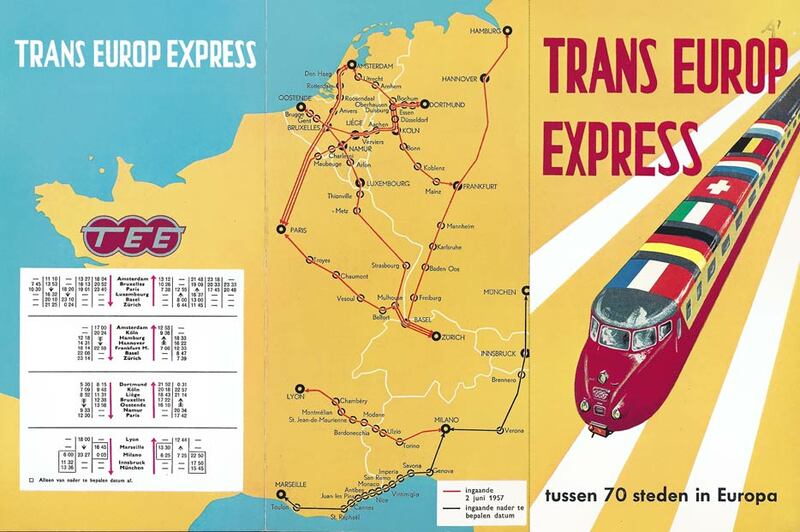 The Belgian railways not only issued TEE posters in French and Dutch, but also in English for the United Kingdom, in view of the Dover-Ostend connection. 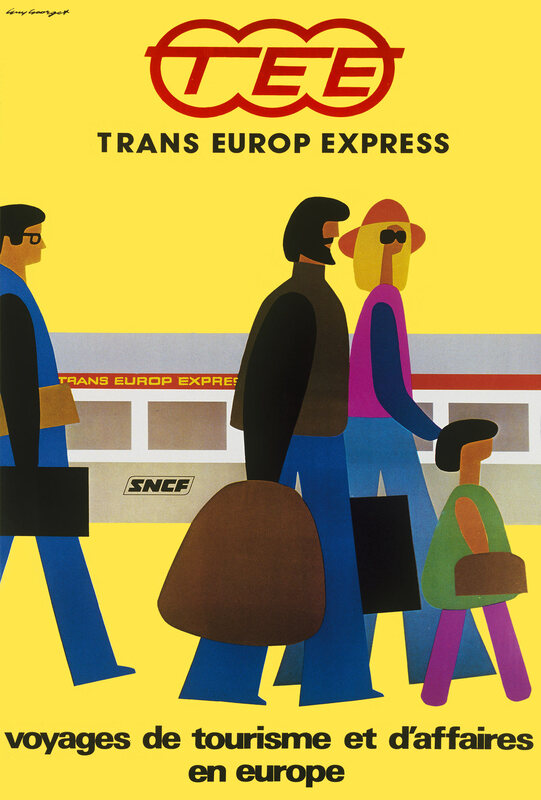 The difference between two Belgian TEE posters, both created in 1962 and depicting the same train, could not be greater. Armand Moussiaux (1899-​1978), who after his retirement as an illustrator for the Belgian railways continued to make posters under the pseudonym Arthal, was a landscape painter by origin. His poster has a scenic-realistic style. In contrast, Paul Funken was trained as an architect. His poster is highly abstracted and uses remarkably fresh colors. Funken depicted passengers below the train with playful strokes as faces. Just like the 1960s TEE poster by De Haan, it shows a lady with lipstick and a gentleman with a hat. 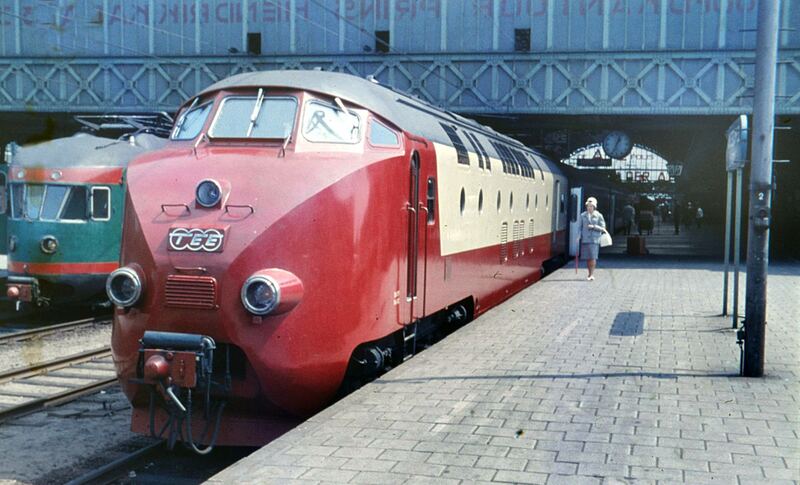 In 1961 a new Swiss train series was completed, called RAe TEE II. It was the first electrical TEE train. The innovative trainsets were the first that could handle the different power systems in Western Europe. 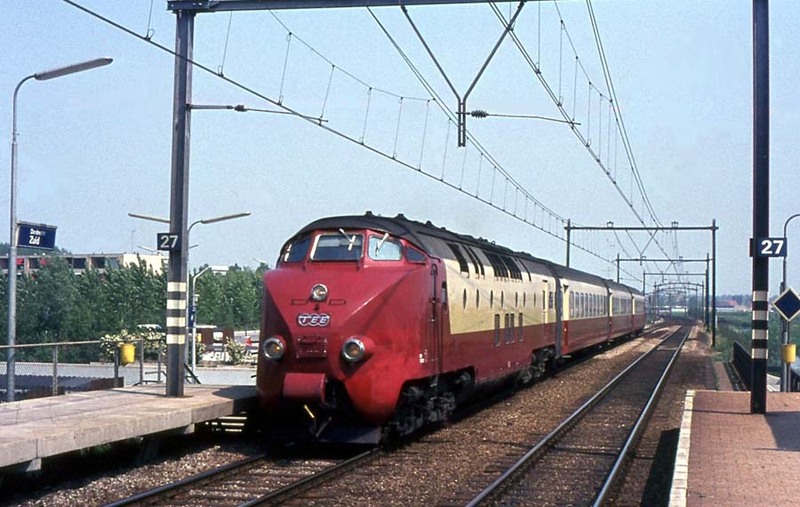 The services of the five-car trainsets included the TEE Cisalpin from Paris to Milan via the Simplon Tunnel. They also ran as TEE Gottardo from Basel to Milan via the Gotthard Tunnel. In the 1970s they ran as TEE Edelweiss to Amsterdam. 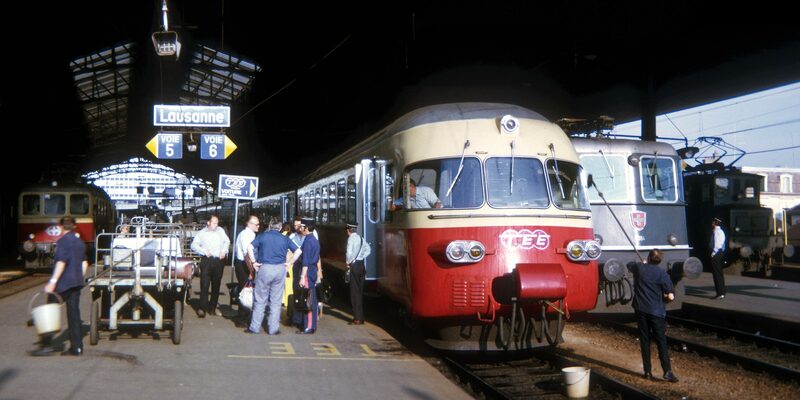 The look of the RAe TEE II was not very different from earlier French and Italian TEE diesel multiple units. Despite the absence of a pronounced front these TEE-colored trains were very recognizable. 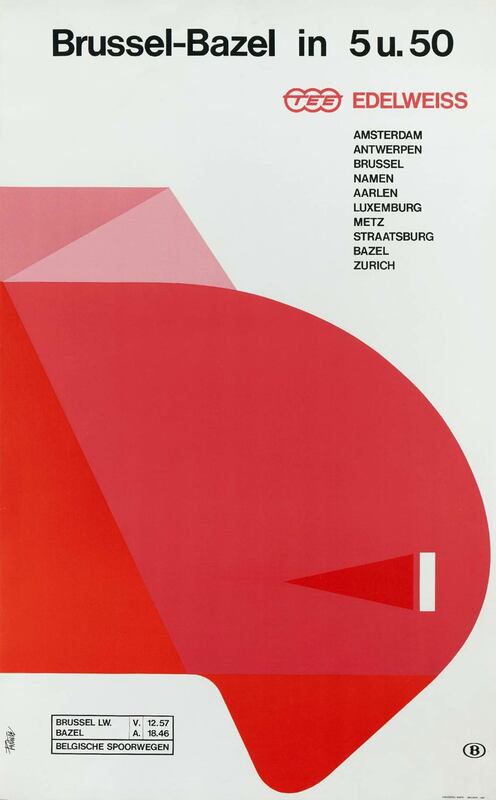 Kurt Wirth (1917-1996) created a nice poster for the TEE Cisalpin ​​around 1961. In addition to his work as an abstract painter he designed posters for Swissair and the Swiss railways. His poster conveys the speed of the TEE by showing after-images of the RAe TEE II front, giving the impression of three movie frames. 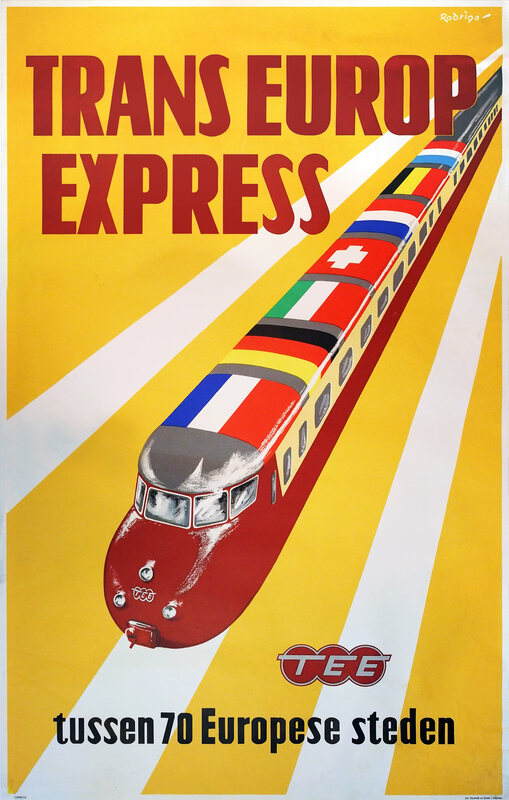 The poster also features a current collector to emphasize electric traction. The tight typography uses the Helvetica typeface, designed in 1957 by Max Medinger. 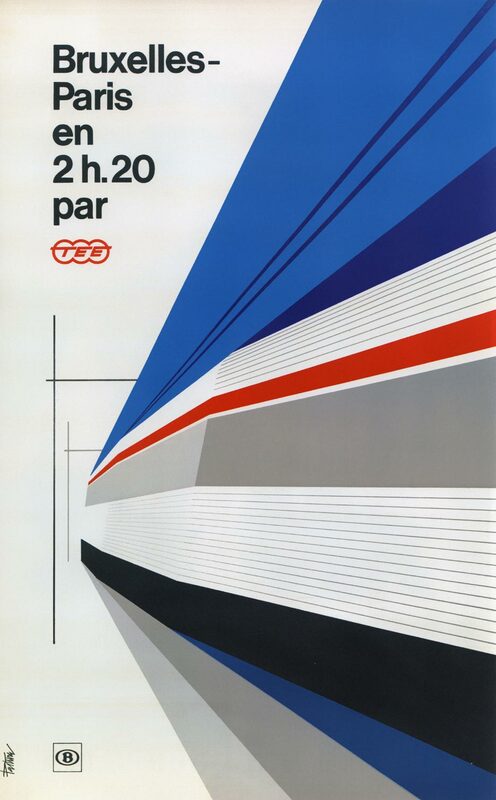 It had quickly become the symbol of Swiss Style. 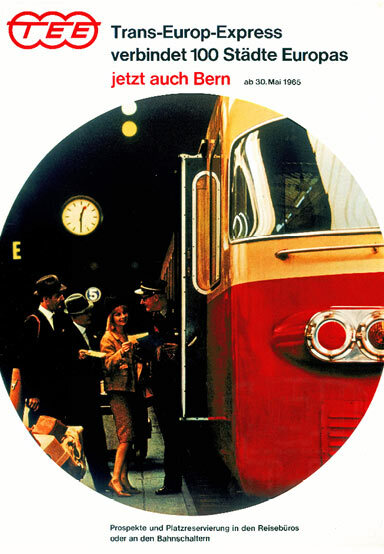 The Helvetica font is also used on an anonymous poster of 1965, issued on the occasion of Bern being connected to the TEE network. 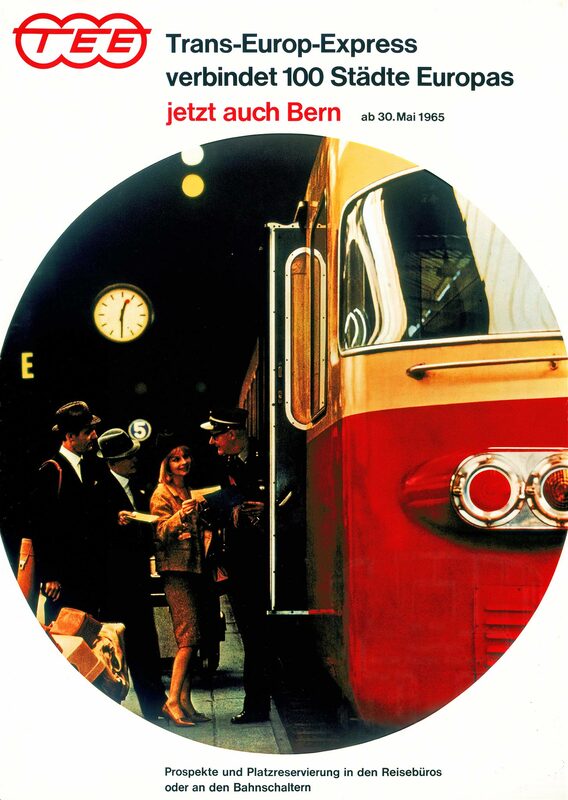 The use of photographs was becoming more common on Swiss posters, but the round shape is unusual. From 1964 onwards the French railways switched over to locomotive-drawn coaches for TEE services. Advanced electrification allowed for faster running speeds than diesel units. 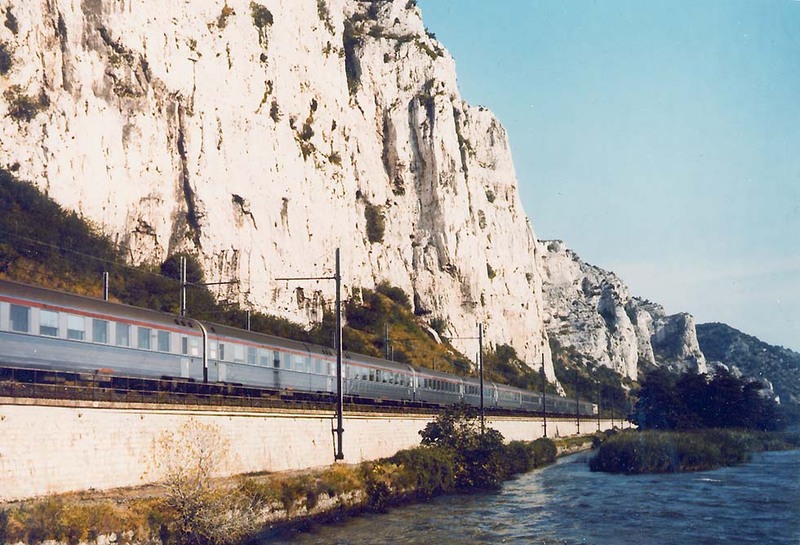 Following the domestic Mistral long-distance train, the Paris-Brussels-Amsterdam line got Inox coaches, stainless steel cars named after the French acier inoxydable, inspired by American streamliners. Along with the coaches the new CC 40100 electric locomotive appeared. It was quadri-current: it could use four power systems, which differed by country. Such locomotives with Inox coaches remained iconic for TEE trains like the Étoile du Nord until the end. 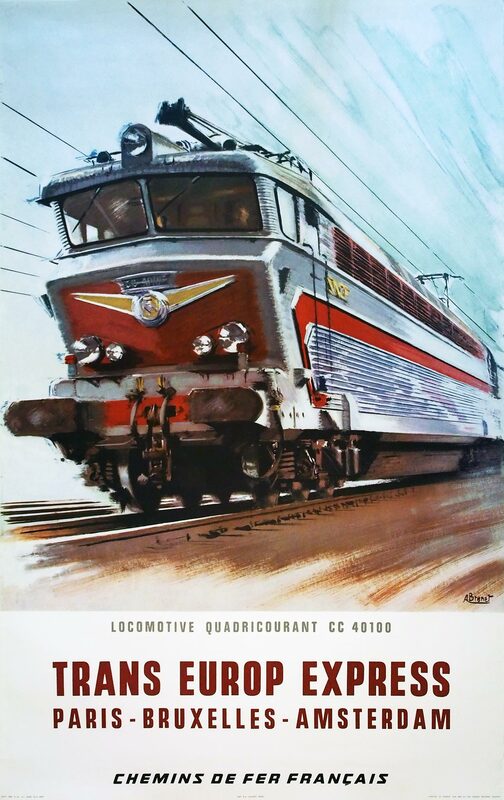 The French painter Albert Brenet (1903-2005) convincingly captured the raw power of the new CC 40100 on a poster. Brenet frequently worked for French railway and airline companies, but was foremost a navy painter. Typical of his style is the alternation of near-photorealism with sketchy brush­strokes. The Belgian posters by André Pasture are totally different. 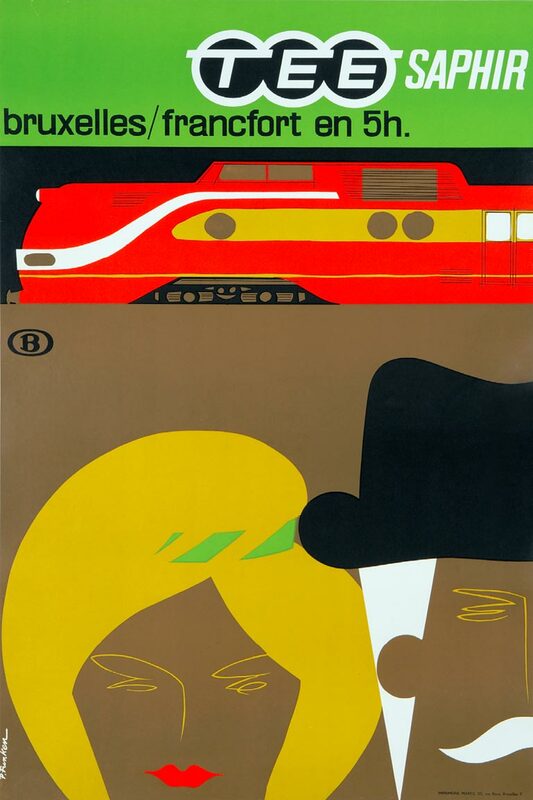 He was a follower of the Swiss minimalist style, as can be seen on his 1968 poster with Inox coaches. 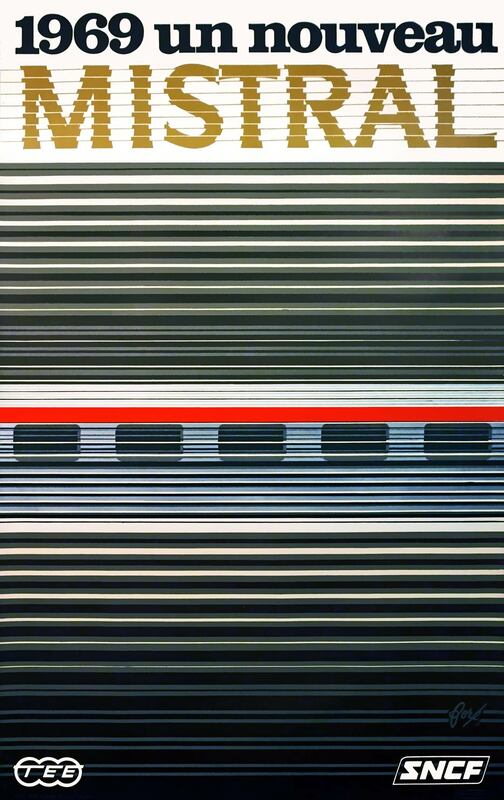 The stainless steel ridges, the red band with Trans Europ Express lettering and the overhead wires were simplified to a few straight lines. In the mid 1960s the international criterion was abandoned for the TEE. Domestic long-distance trains were added to the TEE network. The most famous one was the Mistral, which had connected Paris, Marseilles and Nice since 1950. With an average of nearly 130 km/h it was the fastest train in Europe until the TGV. 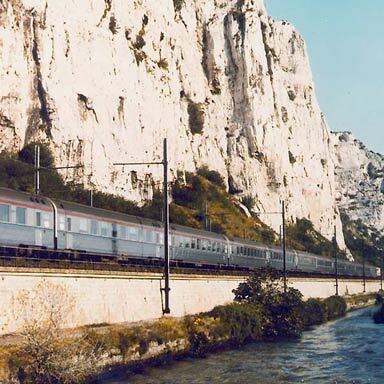 In 1969, the Mistral was given new Inox coaches that were even more comfortable than its predecessors. The prolific French designer Philippe Foré (1927-) created a poster for the new Mistral. He succeeded even better than Pasture in depicting the essence of Inox coaches. His typography was much more playful than his 'strict' Belgian colleague was using. TEE trains with Inox coaches consisted of compartment and lounge cars, a bar car, and a kitchen car from which meals were served at the seats. 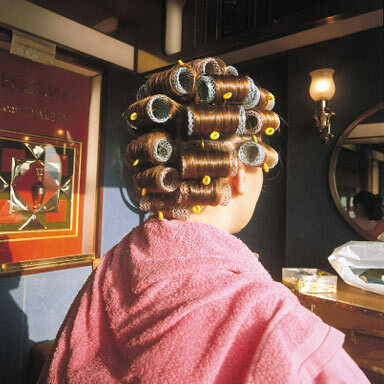 The TEE Mistral had a special on-board service: a hairdressing salon, which was located inside the bar car. Around 1975 the TEE network reached its greatest extent. A few years later the decline started. 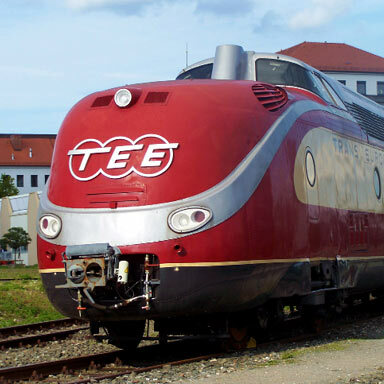 In 1979 the German railways converted a number of TEEs into Intercity trains with two classes, other countries followed suit. In 1987 most TEEs were replaced by two-class EuroCity trains. Air traffic increased and became more affordable. TEE trains were relatively expensive, Intercity trains with a choice between two classes proved more popular. At the same time high-speed trains arrived, firstly the French TGV in 1981 and the German ICE from 1985 onwards. In many respects these trains were a continuation of the TEE, but the 'error' to offer first-class only was not made again. 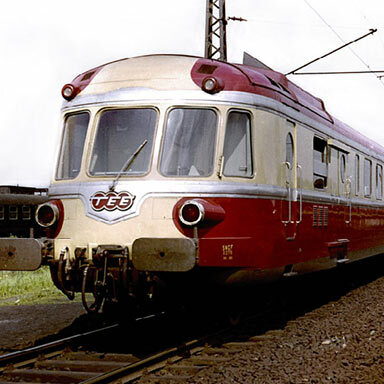 In 1974 the Swiss-Dutch diesel multiple units of the TEE Edelweiss were taken out of service. The service was now electrically hauled. The units were sold to a Canadian railway company, which abolished them in 1996. A group of railway enthusiasts brought five cars back to Europe, including two control cars. The motor cars had already been demolished. 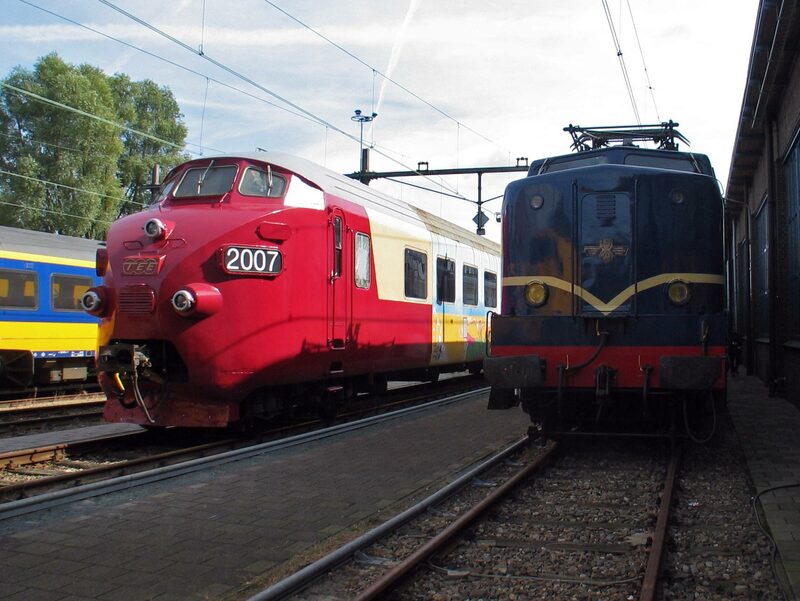 The Trans Europ Express Netherlands Foundation is committed to refurbishing the trains. For now they are parked near Amsterdam Central Station, easily visible from regular trains. 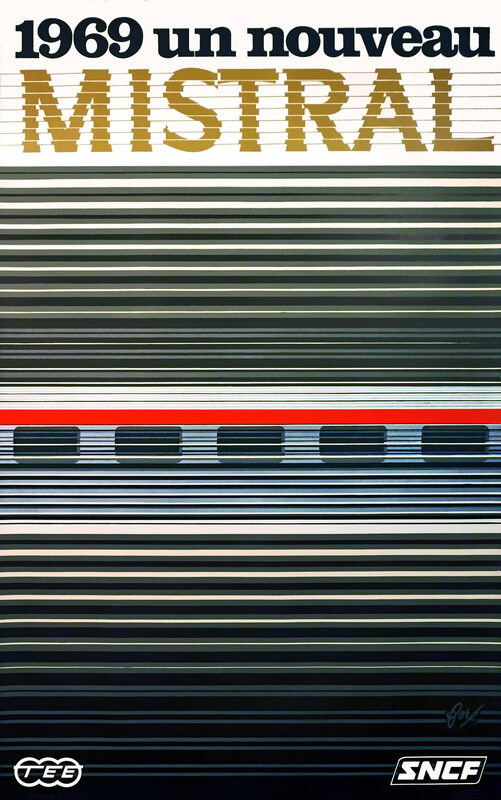 Elisabeth Palm-Baumann und Konrad Hierl, Die Frühe Bundesbahn - Eindrucksvolle Farb-Fotografien von Reinhold Palm Stuttgart 1989. Udo Boersma, Daniel Häni, Nico Spilt, Han Timmer, Jean Vernet and Roel ter Voort.